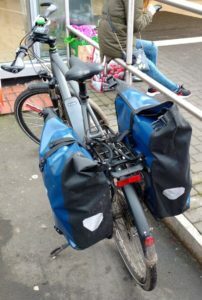 Case study: ebikes have changed my world! Bath is a city of seven hills, which makes cycling hard. As someone who cycles primarily to get around the city, this meant that for many years I would ride my pushbike when I knew the journey was downhill, and my return journey would involve me either pushing the bike back up a hill or choosing a longer, meandering route home that avoided the steeper climbs. If I had a meeting on another hill I would simply get into my car and drive, not able to face the long slog on my bicycle. In fact, for many months I would even ride my folding commuter bike down the hill then fold it up and take the bus or a taxi home. Hills were my nemesis and I felt beaten by them. Then, after trying out a few ebikes, I took the plunge in November 2016 and bought myself a high torque (75Nm) mid-drive ebike. I had done my research. A 130kg man on some of the cheaper hub-drive (30Nm) bikes simply wouldn’t be enough. The ebike was transformational – I went from being mentally and physically unable to ride up hills to not even thinking about them. My shortcut home now was up the rather steep Holloway (that leads up to Wellsway). Cycling to meetings at the university became an afterthought. In fact, it got to the point where I wasn’t using my own car and we were going out in the family car only. When my car was written off (not by me! ), we decided not to replace it as it had sat there for two months doing very little. More importantly, Bath has become an absolute joy to explore on my ebike and I am no longer somebody that just explores the river valley. I even challenged myself to ride Perrymead up to Foxhill and did it in under three minutes! It was hard work, though! It is important to remember that an ebike only helps you pedal; when you ride up very steep hills you still have to put in some effort. With a good set of panniers I now regularly do the supermarket shop. Recently, my ebike was in for a service so I got out my old mbike (mechanical), rode it into town to work, and it’s sat there for the last eight weeks as I brace myself to ride it back home. 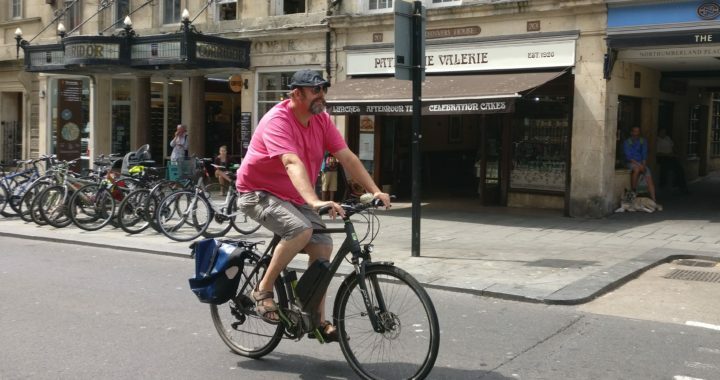 Before I bought my ebike, the reality was – with my slightly dodgy knee and needing to lose a bit of weight – that the hills of Bath absolutely had me beaten. Ebikes have changed hills for me from ‘no can do’ to ‘yes I can’. 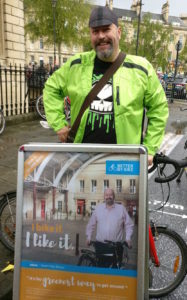 Caroline Kay (Bath Preservation Trust) recently told me that an ebike should not be considered as a bicycle but rather a really cheap car. Ebikes are simply amazing: in any congested city they allow you to get from A to B easily, consistently fast (15.5mph), hills or no hills. I recently helped BBC Points West do a piece about air pollution. They complained that I was moving through the city too fast, creating very few data points. Ebikes are simply exceptional personal transport devices. If you do decide to buy one, you absolutely get what you pay for. It’s important to recognise it is a machine (with a computer), and it can go wrong. You will need to get it serviced, and you will miss it while it is being serviced. I would always buy from your local bike shop or, at a minimum, buy a make that your local bike shop can service, including updating the software! Your local bike shop will happily let you try one out. I really cannot recommend ebikes enough.